At JNC Chauffeurs, we understand the importance of reliable and comfortable transfers to and from the airport. Flights, whether they be for business or pleasure, can involve a degree of stress which can be compounded by having to navigate your own way to the airport and then deal with parking as well. Even if you don’t intend to drive yourself, relying on taxis can pose their own risks as they may have a client beforehand and become stuck in traffic or may have a client to get to after your intended drop off and therefore be less flexible if delays are posed by the flight, security or any other factor. We therefore strive to reduce this unnecessary stress and ensure that the journey to and from the airport is relaxing, comfortable and luxurious for our clients. Our chauffeur-driven fleet of luxury vehicles provides complimentary Wi-Fi, multiple device charging ports, chilled bottles of water and any other refreshments upon request so that you have everything you need for your journey at your fingertips. Our fleet of 16 vehicles includes Jaguar and Mercedes cars, including 7-8 and 16 seaters, so no matter how many in your travelling party, we have a vehicle suitable for your needs, travelling companions and luggage. Our professional chauffeurs are all English-speaking drivers, experienced in dealing with the specific nature of airport transfers to all major UK airports. Our chauffeurs are therefore familiar with all routes to the airports and the different situations posed dependent on the time of day of travel. They are not only experienced in the routes involved, but also understand the importance of monitoring travel updates for potential delays or road works. In addition to this, they provide a professional meet and greet service at the airport in the arrivals lounge to assist with your luggage and so that you don’t have to worry about waiting in the wrong location outside of the airport or missing their vehicle. Their priority is to provide a reliable, relaxing and executive service to make your journey as enjoyable and carefree as possible. In addition to easing the pressure of travel and parking, we also provide airport transfers 24/7, making it easier for you to travel at different times of day or night. We firmly believe that whether you’re travelling for business or holiday, dealing with driving to the airport is one less thing to worry about and we aim to ensure that not only is it not a concern, but it becomes an enjoyable, comfortable experience for you in one of our luxury vehicles. 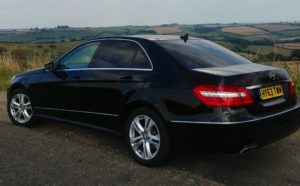 Contact JNC Chauffeurs today to arrange your luxury airport transfer. Not only will we strive to meet your individual requirements in terms of timings, vehicle and other needs, but we can also offer our prestigious private transport service at competitive prices.